Parents are getting more creative and innovative by the minute when it comes to taking poignant, clever pictures of their kids, and photographer Jaime C. Moore's recent project, Not Just a Girl really captured my heart. As the mother of a 5 year-old daughter myself, I was particularly moved that Moore chose to commemorate her daughter Emma's 5th birthday with a stunning pictorial. 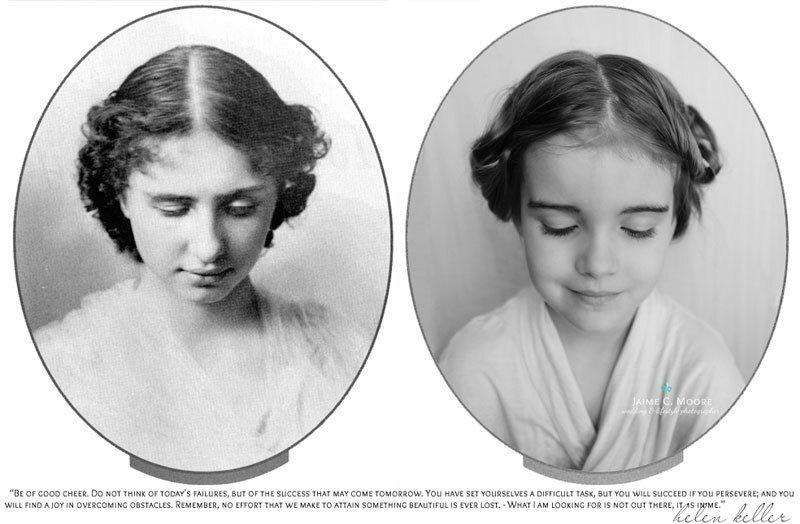 Emma dressed-up as "five amazing and strong women" to gain insight into the journey of her forebears -- and to appreciate how they paved the road to her having so many opportunities to do and be whomever she wants to be. Since our young girls are surrounded by female Disney princess characters and Barbie dolls, who Moore rightly states are an "unrealistic fantasy for most girls," she decided to give Emma a better understanding of what true girl power really means. Read on to see the fantastic photographs in the Not Just a Girl series, and to read my mom-to-mom interview with Jaime C. Moore. Inhabitots: I read the inspiration behind Not Just A Girl, and I say a big “Bravo!” Can you tell me why you chose/ how you decided on these 5 specific women? Jaime C. Moore: There were many different reasons why I chose these 5 amazing women. Each woman is so very different in how they’ve lived their lives and how they have changed ours for the better. A big thing for me was that these incredible women overcame such obstacles and persevered to change their lives simply because they wanted to…. Amelia wanted to fly a plane, so she did. Not letting society’s “rules” direct their lives for them, they raised the bar and we should continue to. Inhabitots: If you did the same pictorial with modern-day women you’d like your daughter to learn more about and respect, who would you include? Jaime C. Moore: Ooh that’s a tough one, so many amazing women to choose from… I was looking for women who broke the barrier of doing what they were told or who thought outside the box to make change happen, so off the top of my head I would have to say Hillary Clinton, Janet Napolitano, Maggie Doyne and Oprah Winfrey just to name a few. Inhabitots: Did your daughter enjoy “dressing up” in these costumes? What was her favorite part of the process? Jaime C. Moore : Emma is a very creative and independent girl herself. I had mentioned several times about needing to photograph her 5 year portraits and when I proposed the idea of doing something completely new, she was so excited. We had so much fun picking out the costume pieces and through each woman’s portrait I would tell her about each incredible woman. Learning of Amelia Earhart seemed to be her favorite (although Jane Goodall was a close second), just the idea of her dressing like the first female pilot to fly across the Atlantic and Pacific Ocean thrilled her. I love her facial expression in the photograph, I took the shot as I was cheering “Emma you just flew a plane, by yourself, over the Ocean!”, in her eyes I see so much pride and confidence. I love seeing that come through an image and it means so much more seeing it in my daughter’s eyes. Inhabitots: What do you think your daughter learned the most from this project that she could share with/teach other girls? Jaime C. Moore: My hope is that it has taught her she can do anything! Those are very powerful words to live by, to hear from your parents and see proof (in a photograph) that really anything can happen, anything you set your mind to. The sky is the limit, but even then, there are footprints on the moon…. Inhabitots: I read the inspiration behind Not Just A Girl, and I say a big "Bravo!" Can you tell me why you chose/ how you decided on these 5 specific women? Jaime C. Moore: There were many different reasons why I chose these 5 amazing women. Each woman is so very different in how they've lived their lives and how they have changed ours for the better. 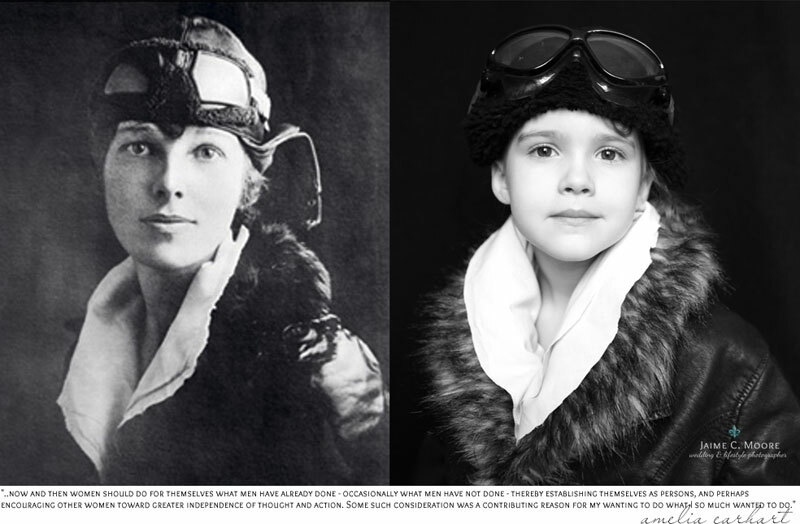 A big thing for me was that these incredible women overcame such obstacles and persevered to change their lives simply because they wanted to.... Amelia wanted to fly a plane, so she did. Not letting society's "rules" direct their lives for them, they raised the bar and we should continue to. Inhabitots: If you did the same pictorial with modern-day women you'd like your daughter to learn more about and respect, who would you include? Jaime C. Moore: Ooh that's a tough one, so many amazing women to choose from... I was looking for women who broke the barrier of doing what they were told or who thought outside the box to make change happen, so off the top of my head I would have to say Hillary Clinton, Janet Napolitano, Maggie Doyne and Oprah Winfrey just to name a few. Inhabitots: Did your daughter enjoy "dressing up" in these costumes? What was her favorite part of the process? Jaime C. Moore : Emma is a very creative and independent girl herself. I had mentioned several times about needing to photograph her 5 year portraits and when I proposed the idea of doing something completely new, she was so excited. We had so much fun picking out the costume pieces and through each woman's portrait I would tell her about each incredible woman. Learning of Amelia Earhart seemed to be her favorite (although Jane Goodall was a close second), just the idea of her dressing like the first female pilot to fly across the Atlantic and Pacific Ocean thrilled her. I love her facial expression in the photograph, I took the shot as I was cheering "Emma you just flew a plane, by yourself, over the Ocean! ", in her eyes I see so much pride and confidence. I love seeing that come through an image and it means so much more seeing it in my daughter's eyes.